Ojon Rare Blend Oil Total Hair Therapy is one of the nicest oils, which are available in drugstores and online stores. The product consists of three colour phases. Will the oil work just as well? Begin your treatment and see what results you will get. Fast application and fruit and flower extracts are certainly advantages of this cosmetic. 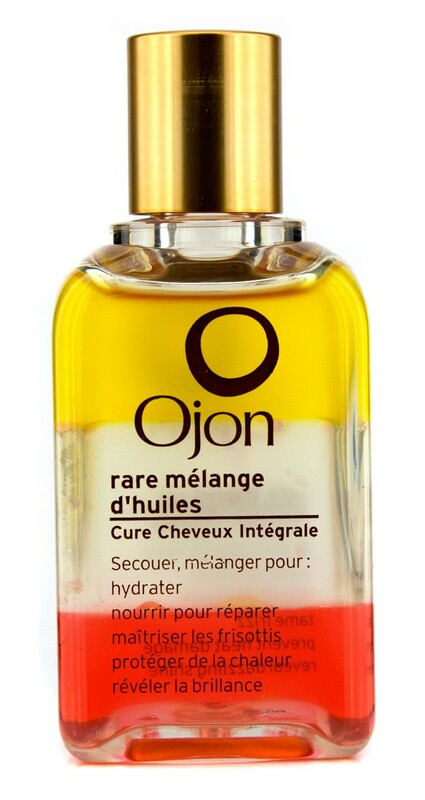 Ojon Rare Blend Oil Total Hair Therapy protects hair from drying out, deeply moisturises and nourishes. Additionally, it protects against heat generated by styling tools and certain substances contained in strong, cleansing shampoos. Therefore, if you use the product regularly, your hair will be shinier, stronger and nicer. Drying, straightening or styling becomes a real pleasure. Ojon Rare Blend Oil Total Hair Therapy restores split ends and prevents frizzand static. Thanks to the oil, brushing will be much simpler, and your wisps will gain a healthy gloss. Ojon Rare Blend Oil Total Hair Therapy smooths hair strands and helps to creaty every hairstyle you wish. It is also a great fixing cosmetic that will extend the durability of your hairstyle. How to apply Ojon Rare Blend Oil Total Hair Therapy? Formula Ojon Rare Blend Oil Total Hair Therapy consists of three differently coloured phases: yellow, white and orange. Before using, shake the bottle well so that the layers of the cosmetic merge. You use two-phase liquid make-up remover in a similar way. How to apply Ojon Rare Blend Oil Total Hair Therapy? First of all, pour a small amount of oil on the palm of your hand and warm it up so that the cosmetic gains a smoother consistency. This way it will be much easier to put it on your hair. Then, apply Ojon Rare Blend Oil Total Hair Therapy on damp or dry hair, starting from the mid-length strands; do not forget the ends. Be sure to thoroughly rub the oil and allow hair to air-dry. Drying hair with hot air could weaken and dry it. Yes of course. People who have damaged, dry and lustreless hair, can successfully try out the oil Ojon Rare Blend Oil Total Hair Therapy. Already at the beginning of the treatment they will see that their hair more shiny, nourished and moisturised. Unfortunately, such cosmetic is not recommended for those who have oily hair and scalp. It could intensify the secretion of sebum, cause the appearance of dandruff and bacterial growth. If you often blow-dry, straighten or style hair with hot tools, Ojon Rare Blend Oil Total Hair Therapy will provide proper thermal protection. It will protect against harmful effects of high temperature and evaporation of water and keratin accumulated in the internal structures of the strands. Do you have curly hair? You must know these problems really well! Laminating hair at home and at the salon. Unusual hair stylisation – curled hair with the cheese puffs! Superfast hair dryer: Dyson Supersonic. Hair oils © 2019. All Rights Reserved.